The calendar turns, new technology is abound, and social media grows. Instagram is where it’s at when it comes to finding your audience and using the power of visuals to get them hooked. We live in a visual world where pictures are noticed first and foremost before anything else. It’s how you communicate a message instantly. It’s why billboard advertising is so powerful. With Instagram, marketers and business owners have grown their subscribers and followers to crazy levels. At a time where everyone is trying to hit the top rankings on Google, many are not realizing just how effective social media is for getting people flocking to your business. It’s true that social media gets a bad wrap because of the negative publicity in the news but what people don’t understand is just how effective social media is for brand growth. 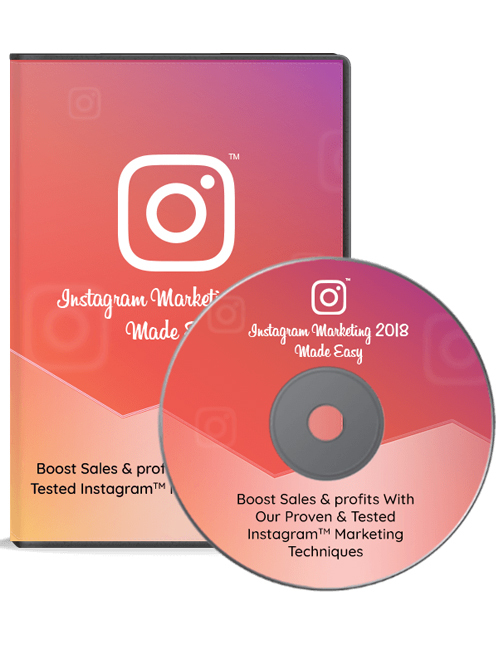 In this series of videos which compliments the Instagram Marketing 2018 Made Easy ebook, you’ll be taken by the hand and shown in detail how to truly make Instagram work for you and your business. You’ll learn about setting up an account the right way, creating great posts, building your brand, promoting offers, getting people onto your sales pages, converting traffic into sales, various monetization methods and much more. You’ll also see various case studies and the many tools available to you. Like it or not, Instagram is the present and the future and if you want to kill it in your business, this is the way to go. Hit the download button now.